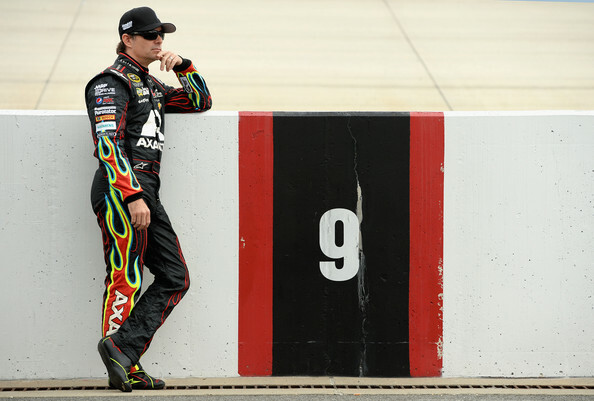 Jeff Gordon posted a hard-fought 10th place finish in the FedEx 400 at Dover International Speedway. Gorodn started 22nd and battled handling issues for the balance of the event. However, a well-timed caution flag late in the event allowed him to get back on the lead lap. 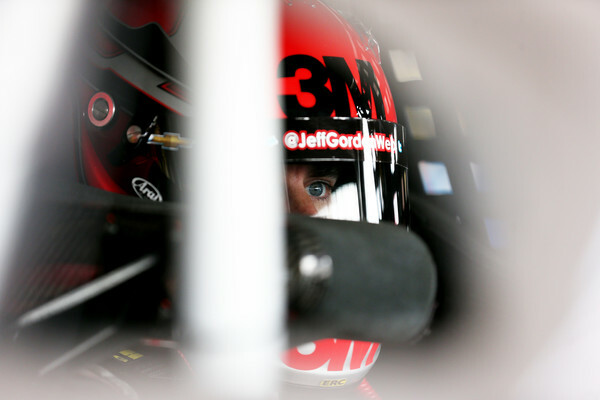 Fresher tires gave Gordon the chance to solidify a top-10 effort. 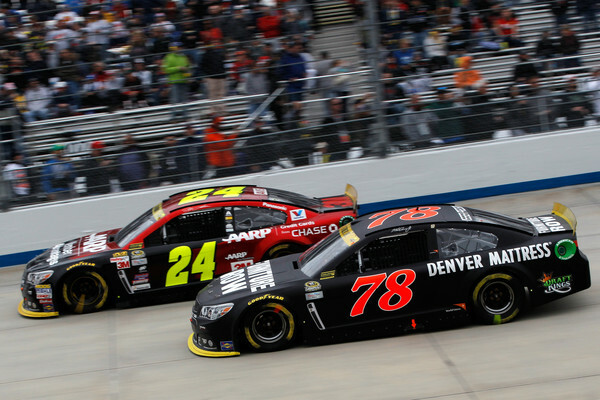 It was Gordon’s 5th top-10 in the last 6 races at Dover. Gordon started 22nd and moved into the top-20 by the end of the first lap. On lap 15, he took 15th from Paul Menard with an outside move coming off turn 2. 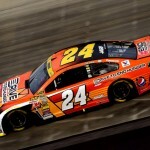 His forward progress slowed as he took 14th place from Ricky Stenhouse on lap 55. The first caution for debris waved on lap 72 as Gordon was less than 3 seconds from going a lap down. Pit stops ensued with Gordon restarting in 15th on lap 79. 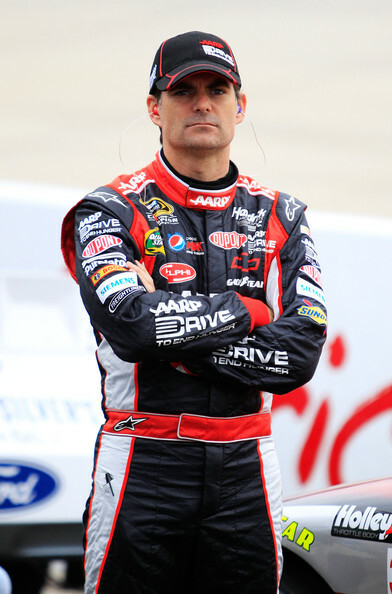 He made steady progress after the restart and took 13th from Greg Biffle on lap 90. 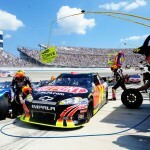 However, Clint Bowyer took a spot from Gordon on lap 107. Five laps later he dropped to 16th as his lap times slowed. However, he regrouped to move back up to 14th place by lap 150. Gordon came to pit road for a green flag stop on lap 156. The second caution waved on lap 161 for Ricky Stenhouse’s wall contact. Gordon came to pit road for additional adjustments and restarted in 17th place. The next caution waved on lap 175 for a crash involving Trevor Bayne, Michael Annett, and Justin Allgaier. Gordon stayed on the track during the caution and moved up to 11th for the restart on lap 183. 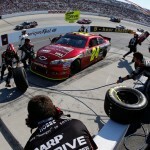 At the halfway point, Gordon ran in 15th place as drivers with fresher tires went by. He battled handling issues and dropped to 18th by lap 230. He came to pit road for a green flag stop on lap 250, and cycled through in 17th place. The next caution waved for debris on lap 261. Pit stops followed and Gordon restarted in 17th. He took spots from Brian Scott and Aric Almirola to move back into the top-15 on lap 280. With 100 laps to go, he passed Danica Patrick to take 14th. He took 12th with 90 to go after Matt Kenseth came to pit road. 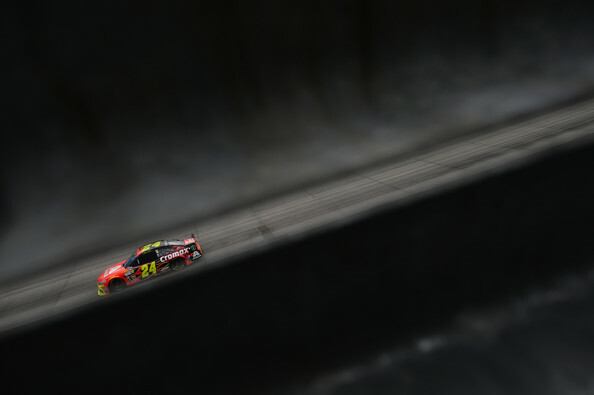 Gordon took 11th from Joey Logano on lap 318 and closed in on the top-10. Gordon came to pit road for a green flag stop on lap 335 and cycled through in 17th place (1 lap down) due to some pushing the limits on fuel. After Joey Logano and Brad Keselowski came to pit road, Gordon advanced to 12th place with 40 to go and got back on the lead lap. 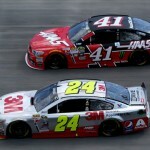 However, he dropped a lap down when race leader Kevin Harvick passed with 27 to go. A caution with 25 to go for Kyle Busch and Brian Scott’s crash allowed Gordon to get back on the lead lap in 11th place. 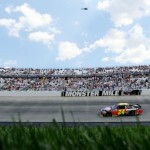 Gordon moved up to 9th with 15 to go when Denny Hamlin crashed and collected Kurt Busch. Gordon came to pit road for tires and restarted in 9th. 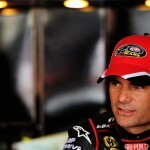 He took 8th from Aric Almirola with 7 to go, and took 7th from Clint Bowyer with 5 to go. A caution for Casey Mears’ spin with 2 laps to go set up a green/white/checkered finish. On the restart, Gordon dropped back on the inside line and came across the line in 10th place. 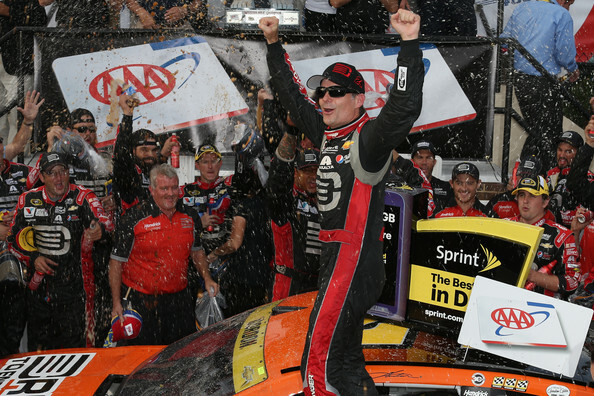 Jeff Gordon passed Brad Keselowski after the 300-lap mark and pulled away in the closing stages to win his 4th race of the 2014 season, and 92nd of his NASCAR Cup series career. This is the most wins Gordon has scored in a single season since 2007. 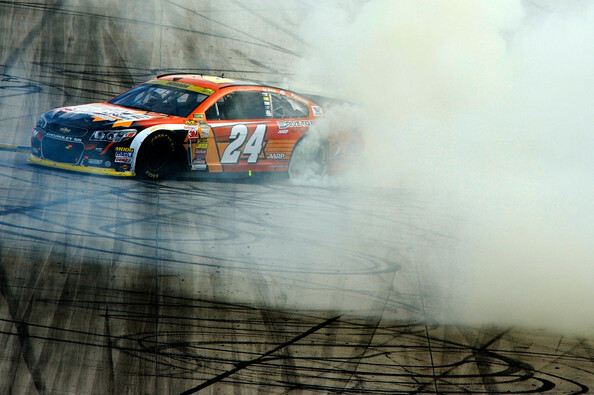 In addition, it’s his first win at Dover since 2001. Gordon is one of 12 drivers to advance to the three-race Contender round, which includes races at Kansas, Charlotte, and Talladega. Gordon started 6th and moved into the top-5 by the end of the first lap. 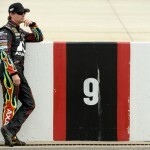 He took 4th from Denny Hamlin on lap 13 and moved to 3rd with a pass on Kyle Busch on lap 25. A debris caution slowed the field on lap 62 and brought the leaders to pit road. Gordon held the 3rd position through the round of stops. He slipped to 4th after Hamlin went by on the restart. A caution on lap 74 saw the leaders stay on the track. 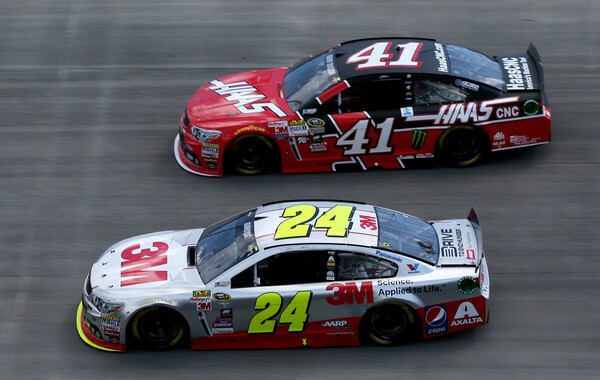 On the restart, Gordon used the outside line to his advantage and took 3rd from Hamlin. He took the runner-up spot from Brad Keselowski on lap 119 and closed in on Kevin Harvick for the race lead. A debris caution on lap 124 brought the leaders to pit road. 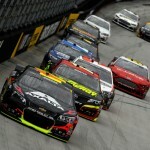 Gordon held the 2nd spot through the stops, but fell to 3rd after the restart when Keselowski went by on the outside. A caution for JJ Yeley’s wall contact brought out the caution on lap 174. A missed lugnut on the pit stop dropped Gordon to 7th for the restart on lap 179. 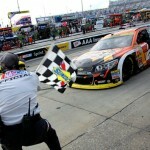 He took 6th from Denny Hamlin and moved around Kyle Busch to take 5th just prior to the halfway point. On lap 206, Gordon took 4th from Matt Kenseth. 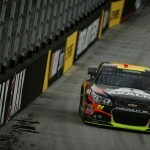 He passed Jimmie Johnson on lap 223 to take 3rd and essentially made up the positions lost from the pit road miscue. He came to pit road for a green flag stop on lap 249 and cycled through in 3rd place. 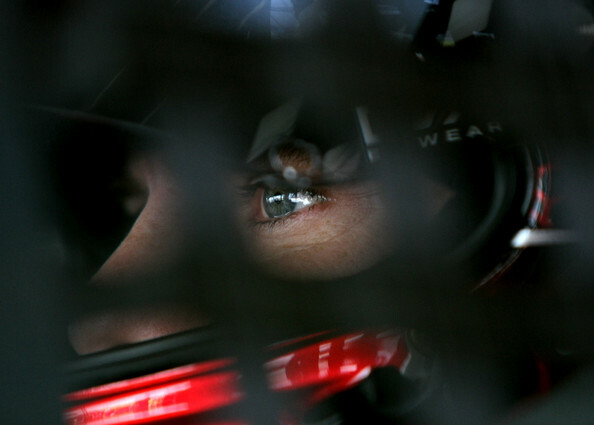 Harvick cut a tire on lap 253 to bring out the caution, which allowed Gordon to move to 2nd place behind Keselowski. Kyle Busch used the high line to take 2nd from Gordon on lap 262. He bided his time and moved around Busch on lap 273. Gordon eventually tracked down Keselowski and took the race lead on lap 306. He came to pit road for a green flag stop on lap 328 and cycled through with the race lead. Keselowski closed to less than a second with 20 laps to go, but was unable to make headway and finished distantly behind Gordon at the finish. Gordon’s car exceled on longer runs, which he used to his advantage after the halfway point of the race to track down Keselowski and pull away for the win. HOW IMPORTANT IS THIS WIN TOWARD GETTING THAT DRIVE FOR THE 5th CHAMPIONSHIP? Early afternoon rain delayed the start nearly two hours. Gordon started 6th and moved to 4th within 5 laps. He took 3rd from Matt Kenseth on lap 10. He dropped a spot to Kenseth, but later passed Brad Keselowski to run 3rd at the competition caution on lap 50. Gordon came to pit road for tires. He made contact with David Ragan while exiting his pit stall as Ragan was making his way in. Gordon returned to pit road for repairs to the right front. He restarted 35th on lap 58 and moved to 32nd prior to a debris caution on lap 61. 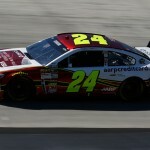 Gordon advanced to 26th by lap 85 as he worked in race traffic. At the 100-lap mark, Gordon ran in 23rd place. Gordon entered the top-20 prior to a caution flag on lap 118 for rain. Gordon came to pit road for tires and exited in 17th place. However, as rain continued, the cars came to pit road for a red flag delay. After a three-hour red flag for rain, racing resumed shortly after 7pm/eastern time. Gordon dropped to 18th before the caution on lap 155. Cole Whitt spun in turn 1 to bring out the caution. Timmy Hill then inexpicably drove into the rear of race leader Matt Kenseth under caution. He moved up to 15th for the restart due to driver’s opting for pit stops. Gordon fell to 29th prior to the competition caution on lap 188 as he battled handling issues. He came to pit road and restarted in 30th place. Gordon moved forward to 23rd place by lap 210. He re-entered the top-20 just before the halfway point and ran 17th on lap 250. 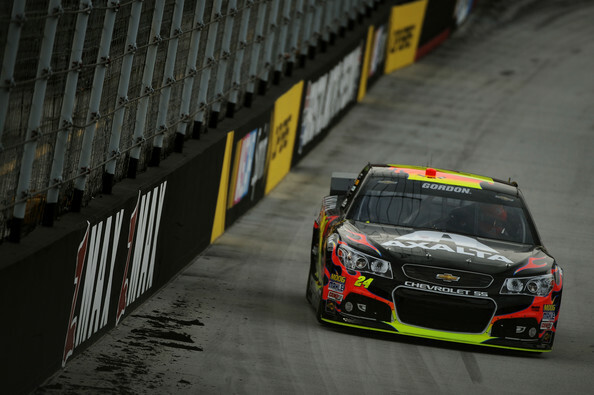 As the green flag run progressed, Gordon moved through traffic and ran 12th on lap 260. He entered the top-10 on lap 273 before a caution for Ryan Truex’s wall contact. 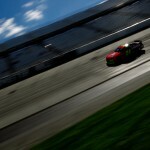 Gordon restarted 9th on lap 285. He took 8th from Brad Keselowski on lap 330, before a caution for David Ragan’s spin. Gordon changed 4 tires and restarted in 12th place. 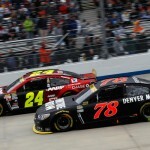 He entered the top-10 within a lap of the restart and took 9th from Denny Hamlin on lap 344. A caution for Kyle Busch’s spin on lap 395 brought out the caution. Gordon came to pit road for tires and restarted in 7th place. 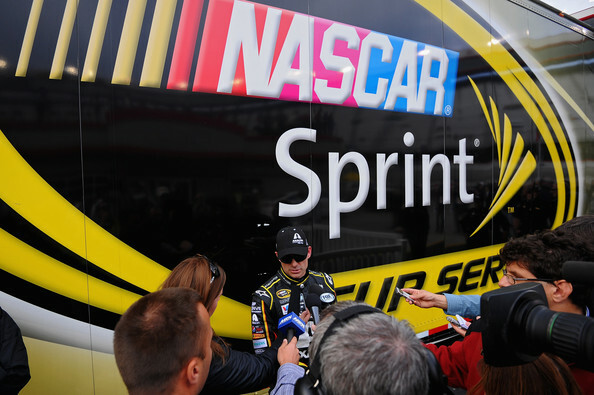 He moved to 6th when Matt Kenseth slid up the track and took 5th from Brad Keselowski with 85 to go. The ninth caution waved on lap 422 for Martin Truex’s spin. Gordon came to pit road for four tires and restarted in 14th place. 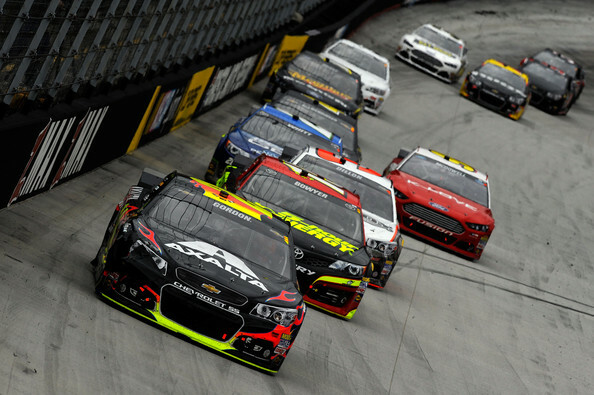 With 65 to go, Gordon moved up to 9th place with a move around Tony Stewart. Five laps later he took 7th from Kasey Kahne. With 50 laps to go, Kevin Harvick’s engine brought out a caution. Brad Keselowski was eliminated in the chain reaction. Gordon came to pit road for tires and restarted in 10th place with 39 to go. 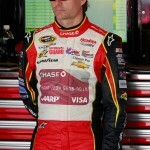 He took 7th from Kahne with 27 to go but lost the spot with 3 to go. 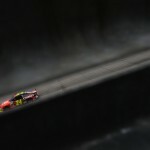 With rain falling under yellow, Gordon came across the line to finish 8th. Gordon was running 4th with 50 laps to go, but opted to come to pit road for tires. He lost track position and was only able to get back to 7th place before the finish. Jimmie Johnson dominated the AAA 400 at Dover International Speedway leading more than half of the event en route to his 8th career win on the 1-mile track. 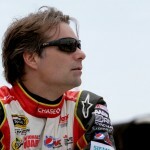 Jeff Gordon posted a 4th place finish and moved into a tie for 4th in the series standings. Gordon started 16th and moved up to 12th place by lap 25. He advanced to 11th prior to the first caution on lap 37 for debris. Pit stops followed with Gordon restarting in 12th place on lap 41. He moved into the top-10 by lap 60 and ran 9th on lap 70. 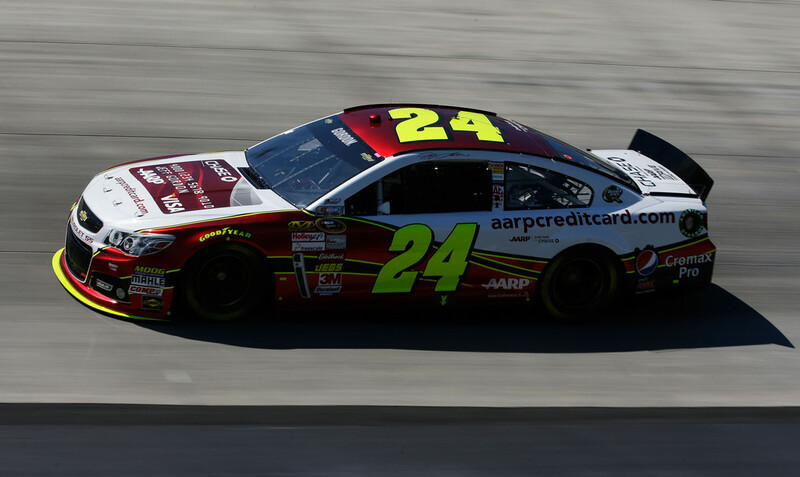 At the 100-lap mark, Gordon ran in 7th place as the #24 car seemed at its best on longer runs. 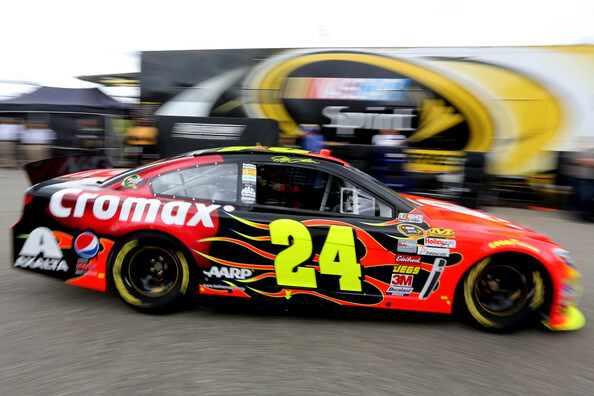 He led two laps prior to green flag pit stops on lap 125 — the fifth consecutive race Gordon has led. Following stops he ran in 8th place, but was unable to make headway over the next 40 laps. A debris caution on lap 164 brought the lead lap cars to pit road. 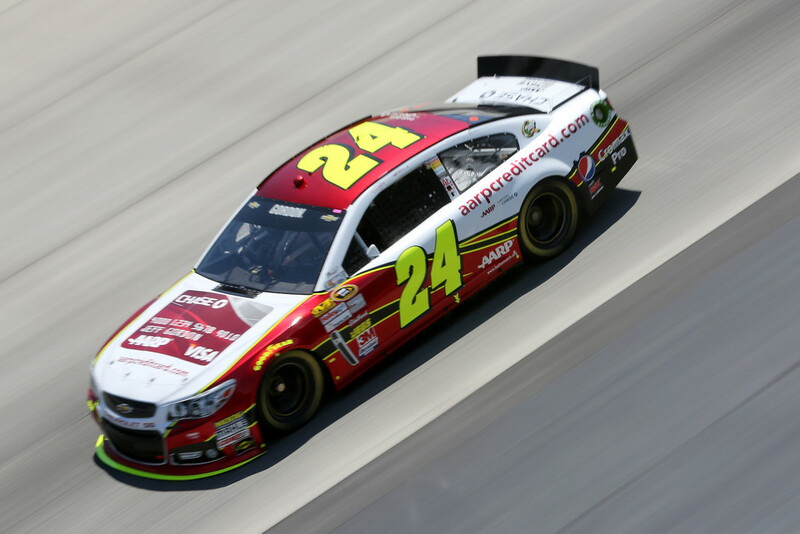 Gordon restarted in 7th place on lap 170. After slipping to 9th on the restart, Gordon rallied back to run 7th at the halfway point. 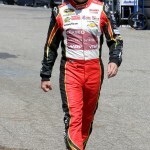 Gordon took 6th from Ryan Newman on lap 224 as the car improved on the long run. A caution on lap 227 for Brad Keselowski’s engine brought the leaders to pit road. Gordon held 6th place through the cycle of pit stops. He used the outside line to his advantage and took 5th shortly after the restart. 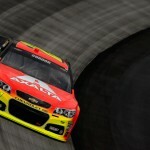 Gordon took 4th from Kyle Busch on lap 264 and moved to 3rd with a pass on Matt Kenseth on lap 266. 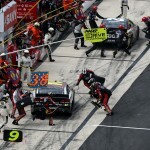 He gained ground on his Hendrick Motorsports teammates Jimmie Johnson and Dale Earnhardt Jr prior to a green flag pit stop cycle on lap 313. A debris caution with 31 laps to go altered late race strategy and brought the leaders to pit road for the final time. 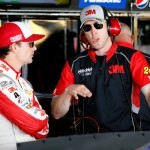 Crew chief Alan Gustafson called for two-tire change and Gordon restarted in 2nd place. Johnson, as the race leader, opted for the outside line for the restart with 27 laps to go. 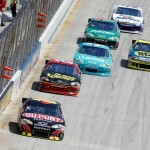 Gordon dropped to 4th on the restart behind Johnson, Earnhardt Jr, and Joey Logano. 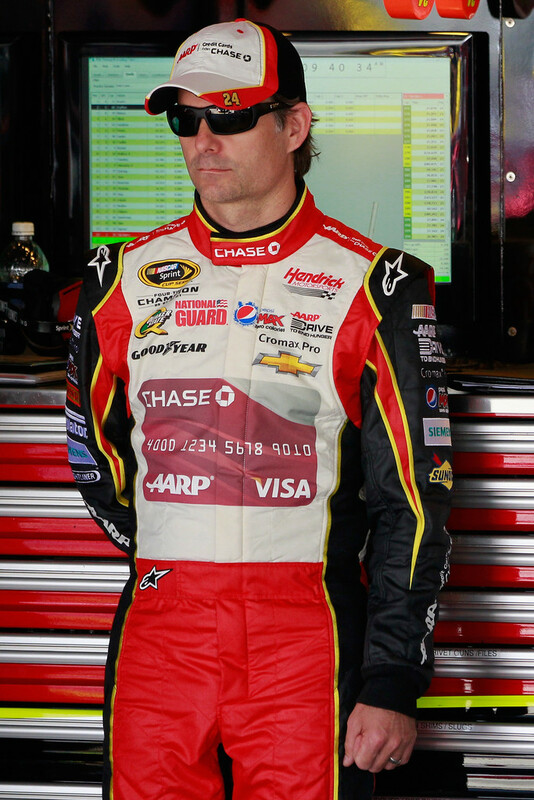 He wound up the event in 4th place — his 5th top-10 in the last 6 races. 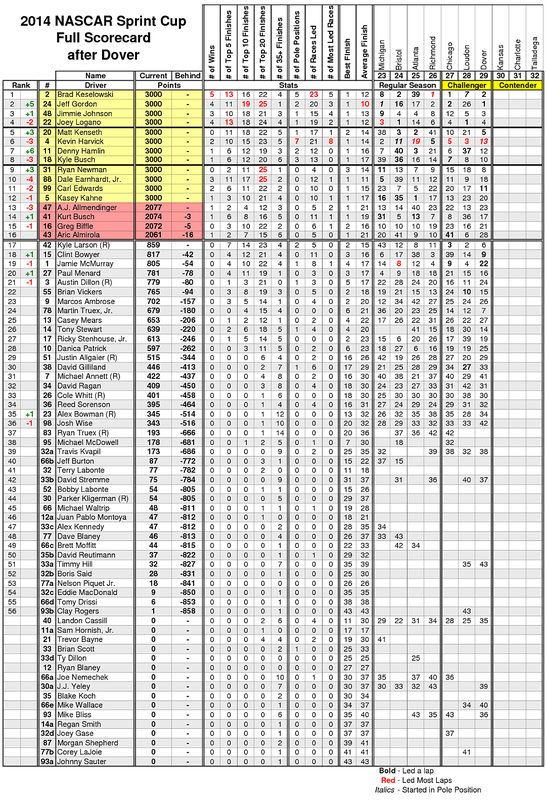 Gordon moved up to a tie for 4th in the series standings, 39 points from the top spot. 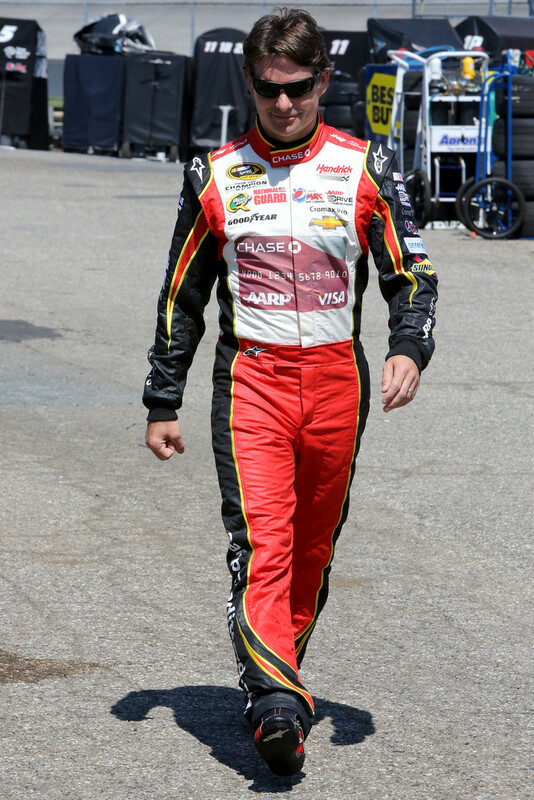 Tony Stewart won his first race of the 2013 season after passing Juan Pablo Montoya with 3 laps to go. 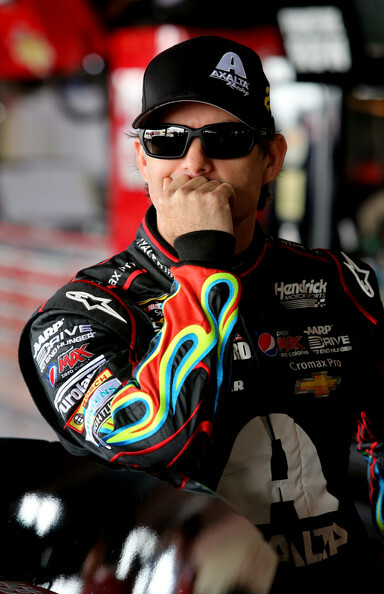 Jeff Gordon might have been able to run down the top-2 with a few extra laps, but came in 3rd after a pit gamble paid off. It was Gordon’s second consecutive top-5 finish and the 301st of his career — tying him with David Pearson in career top-5’s. 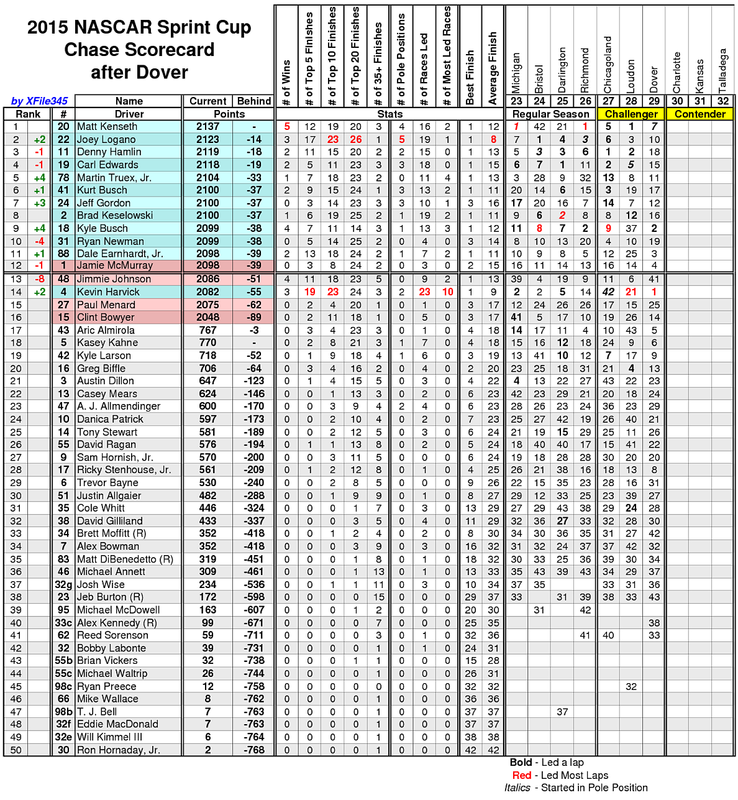 The finish propelled Gordon up to 11th in the series standings. Gordon started 20th and gained 4 spots in the first 20 laps. He moved to 15th on lap 30 while complaining about handling issues. He came to pit road for a green flag stop on lap 73. A debris caution slowed the field on lap 79 with Gordon in 14th place. He pitted for tires and restarted in 13th place on lap 85. However, Gordon faded on the restart and ran 17th on lap 90. As the air pressures came up in the tires, Gordon gained back spots and ran 15th at the 100-lap mark. The handling fell off on the longer run and Gordon fell to 17th on lap 120. The second debris caution brought pit stops on lap 127. He gained 2 spots on pit road and another 2 on the track to run 13th on lap 150. The next caution waved for Matt Kenseth’s blown engine on lap 160. At the halfway point, Gordon ran in 12th place. 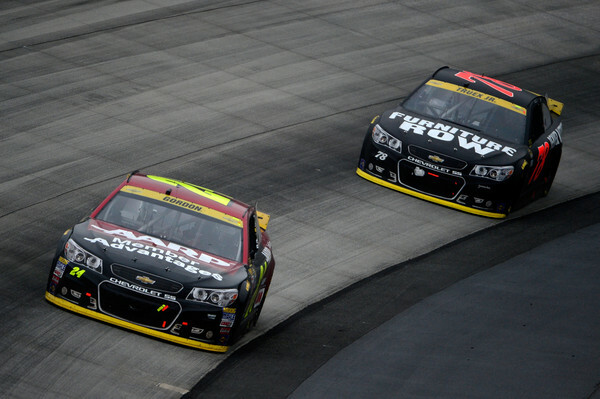 Gordon moved to 11th after the halfway mark, but dropped to 12th when Tony Stewart went by on lap 220. 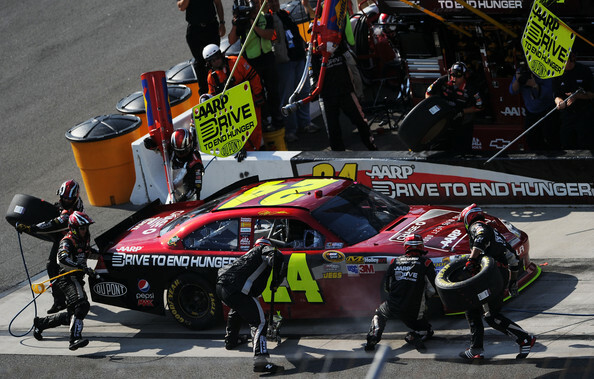 Following a green flag pit stop on lap 238, Gordon ran in 15th place in danger of going a lap down. He moved to 14th prior to a caution on lap 280 for Martin Truex’s engine. Pit stops followed with Gordon exiting in 13th place. Gordon ran 14th at lap 300 when the caution waved for Ryan Newman and David Gilliland’s wreck on the backstretch. 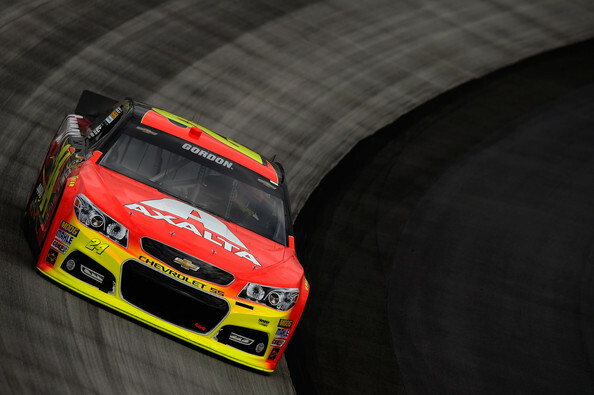 Gordon restarted 14th on lap 306 and dropped to 15th by lap 310. Kasey Kahne’s spin and subsequent wall contact brought out the caution on lap 317. 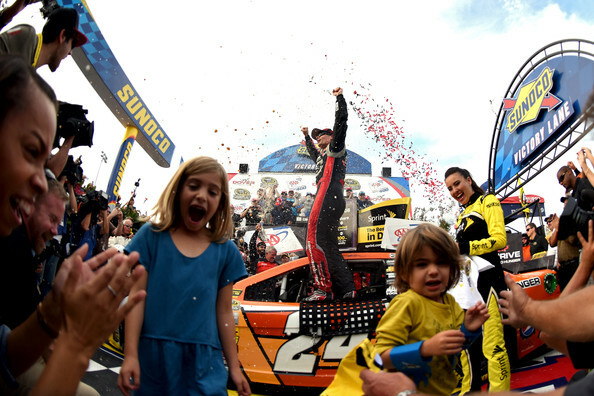 Gordon stayed on the track and restarted in 2nd place — the high water mark of his day. On the restart, Gordon fell to 4th within one lap. However, on the long green flag run, Gordon needed to stop one more time for fuel. 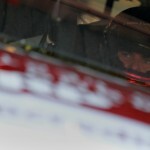 He received a much-needed break with 24 laps to go when Denny Hamlin cut a tire and hit the wall. The crew changed four tires and Gordon restarted 7th with 20 to go. He took 6th from Brad Keselowski with 17 to go and entered the top-5 when Jimmie Johnson was penalized for jumping the restart. 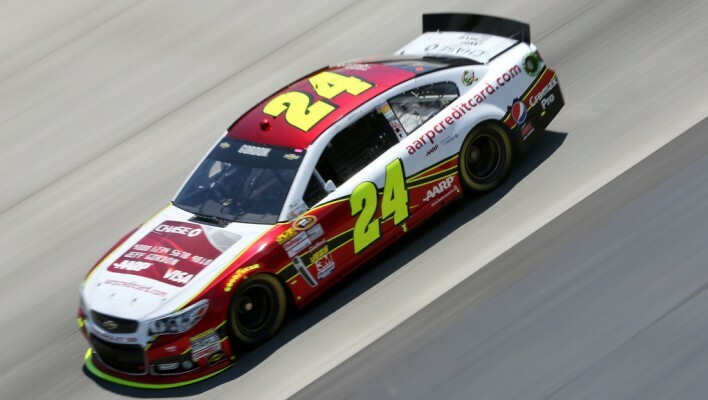 Gordon took 3rd from Kyle Busch with 13 to go and posted his second straight top-5 finish at Dover. 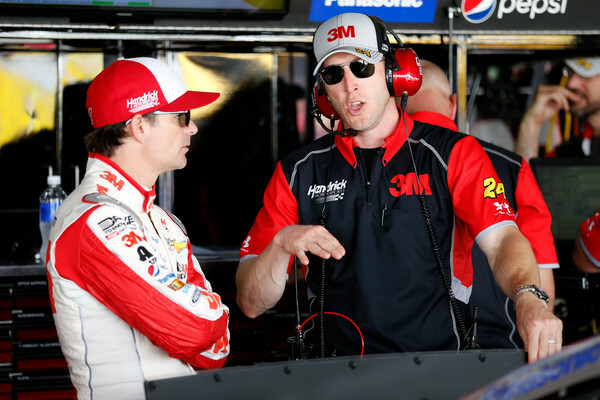 Crew chief Alan Gustafson kept Gordon on the track during a caution period on lap 317. That allowed him to move from 14th to 2nd. A well-timed caution flag with 24 laps to go clinched a top-5 finish. IS THIS A TURNING POINT FOR YOUR SEASON? 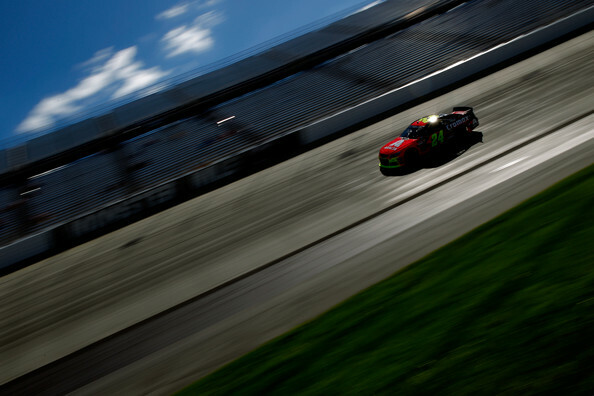 Jeff Gordon’s late summer/early fall streak continued as he posted his fifth top-3 finish in the last six races with a runner-up finish in the AAA 400 at Dover Speedway. Gordon ran in the top-10 for the balance of the day, but relied on a splash of gas during the last caution period to make it to the finish. By doing so, he improved his finishing position by at least 5 spots. He moved up to 10th in the points standings, but trails leader (and Dover winner) Brad Keselowski by 48 points. Gordon started 7th and moved into the top-5 within 10 laps. His forward march continued as he took 4th on lap 15, but was unable to make further headway before a debris caution on lap 70. 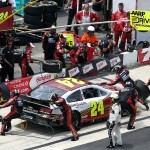 Gordon dropped a spot on pit stops and restarted in 5th place on lap 78. He took 4th from Clint Bowyer after the 100-lap mark but ran distantly behind the top-3 of Kyle Busch, Denny Hamlin, and Jimmie Johnson. Gordon stayed out to lead a lap during a cycle of green flag pit stops on lap 148. A debris caution on lap 178 brought the leaders to pit road. Brad Keselowski tracked down Gordon and dropped him to 5th on lap 214. Another debris caution brought the leaders to pit road on lap 247. Gordon held the 5th spot through the pit stop sequence. On the restart, Gordon fell to 7th after Clint Bowyer and Carl Edwards went by. With just over 100 laps to go, Gordon passed Edwards. A caution with 90 laps to go for Matt Kenseth’s suspension issues brought the leaders to pit road. 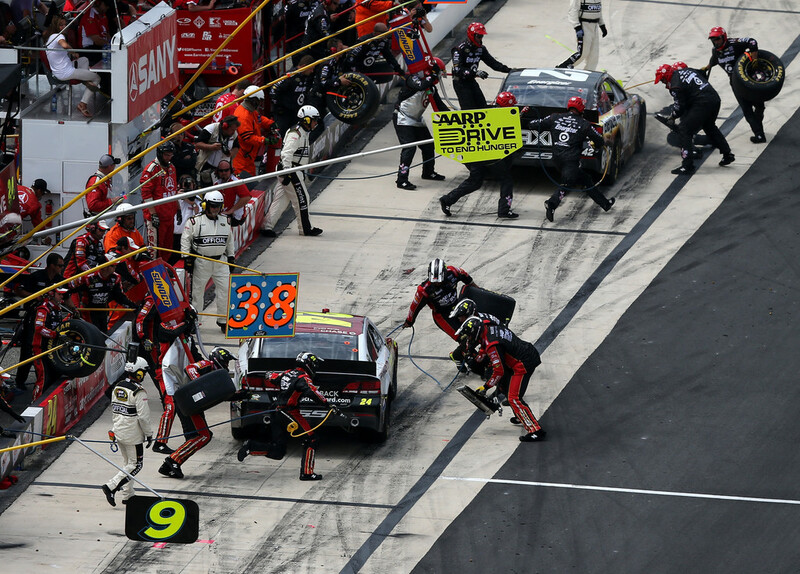 Gordon gained a position on pit road and restarted in 5th place. He lost a spot to Bowyer before Kenseth brought out another caution after a spin in turn 4. Gordon came to pit road to top off the fuel tank. He restarted in 7th place with 78 laps to go. As the laps wound down, Gordon took 6th from Bowyer and moved back into the top-5 with a pass on Kasey Kahne with 48 to go. After Kyle Busch and Denny Hamlin pitted for fuel, Gordon moved to 3rd. 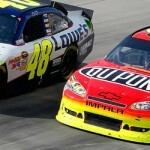 He took 2nd from Jimmie Johnson with 6 laps to go while the #48 was trying to conserve fuel to the finish. Gordon topped off on fuel during the last caution and was able to make it to the finish — salvaging a better finish than his car was during the event. AS YOU WERE CHASING DOWN BRAD KESELOWSKI THERE AT THE END, DID YOU THINK YOU WERE GOING TO GET HIM? 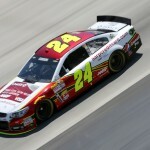 It looked as if Jeff Gordon has his best car at Dover International Speedway in more than 6 years. However, once again, a dose of bad luck cost him a legitimate shot at his 86th career victory. Gordon led 60 laps, but a loose left rear wheel after a pit stop doomed his chances as the laps wound down. 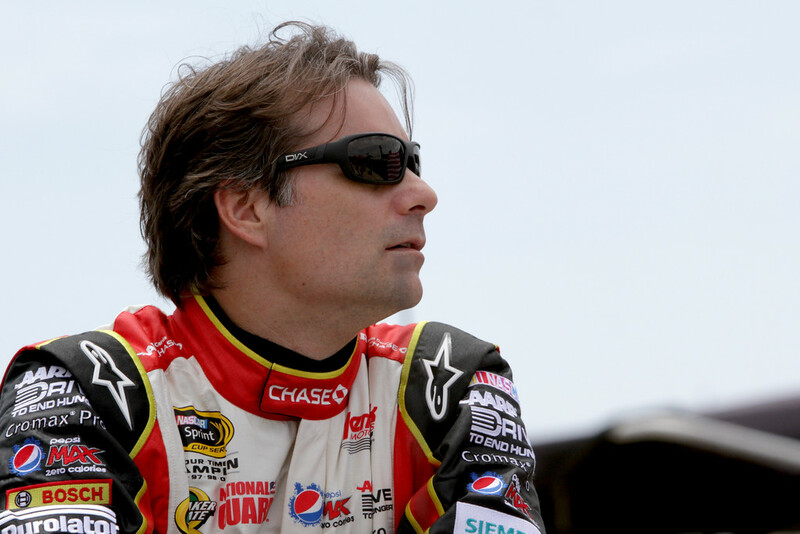 Gordon finished 13th and lamented another lost opportunity. Gordon started 14th and was running 13th on lap 9 when a major pileup occurred on the backstretch after Tony Stewart tapped Landon Cassill. More than 12 cars were collected in the melee. 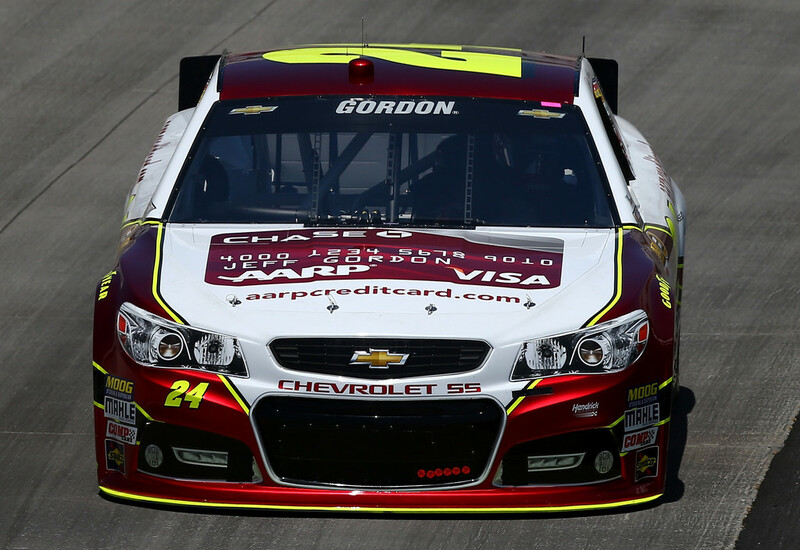 When the green flag waved, Gordon advanced into the top-10 on lap 15. 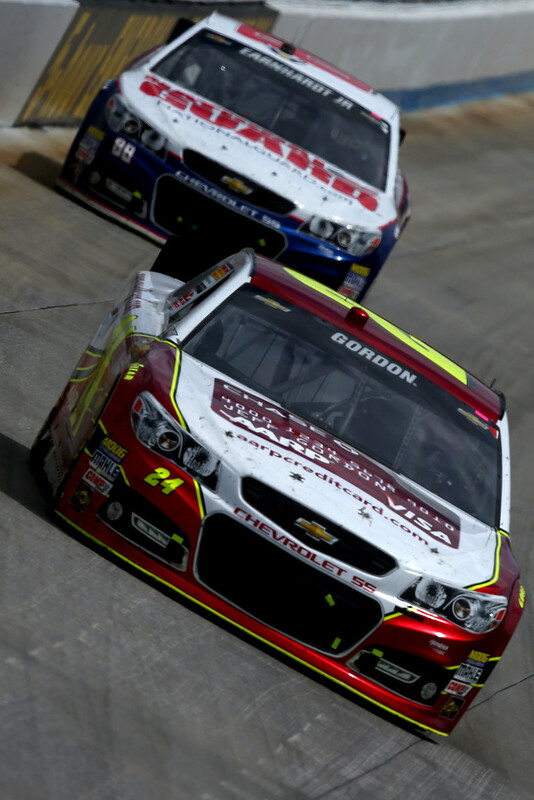 By lap 30, Gordon moved up to the 7th position with a pass on Kevin Harvick. Gordon entered the top-5 on lap 56 after moving around Kyle Busch. 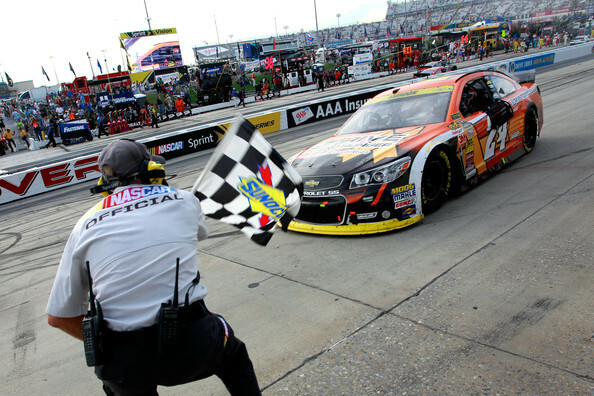 Following a cycle of green flag pit stops, Gordon ran in 5th place. 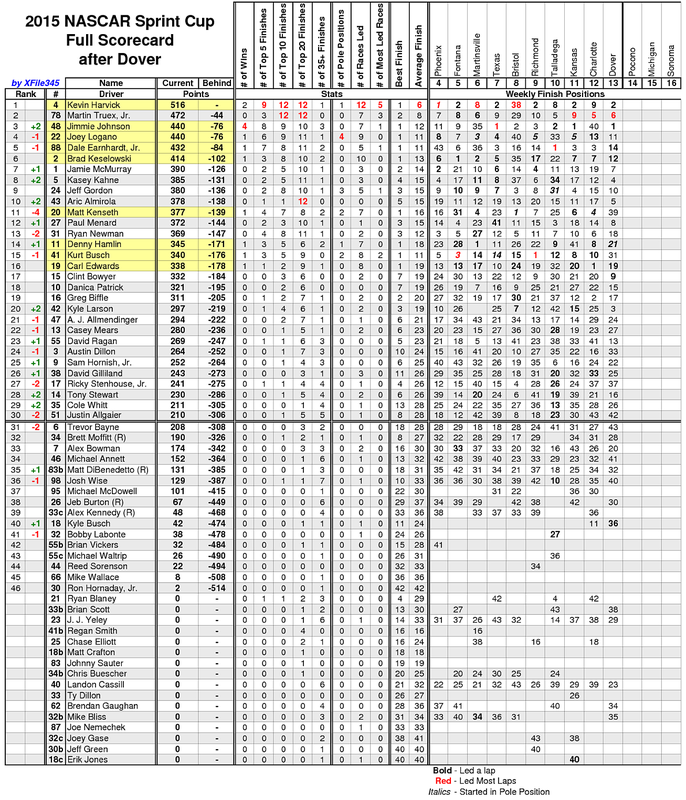 At the 100-lap mark, Gordon ran 3rd behind Jimmie Johnson and Mark Martin. The second caution waved on lap 111 when David Reuttiman’s engine expired. Gordon departed pit road in 5th place, but moved back to 3rd by lap 135. He took the runner-up spot from Busch on lap 145. A caution for Carl Edwards’ wall contact on lap 163 slowed the field. Gordon took the race lead from Johnson shortly after the halfway point. However, Gordon slowed on lap 245 and came to pit road three laps later for tires. A loose left wheel was the culprit that cost Gordon a lap. 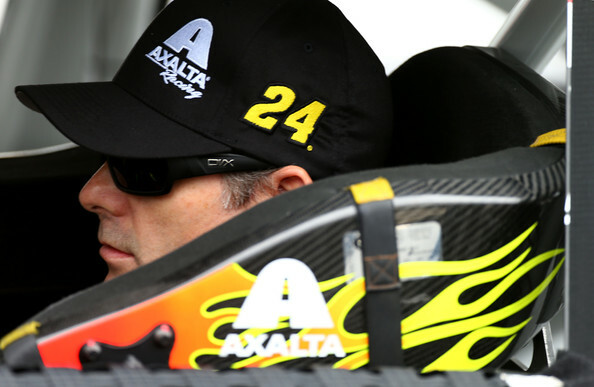 As green flag pit stops began, Gordon stayed on the track and re-assumed the top spot. He came to pit road with 75 laps to go for a four-tire change and returned to the event one lap down. A caution with 60 laps to go trapped Gordon a lap down. Gordon stayed on the track for the wave-around to get back on the lead lap. He restarted in 18th place with 55 to go. 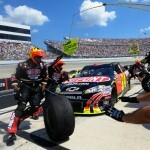 Kurt Busch’s blown engine and subsequent caution allowed Gordon to get fresh tires. Gordon moved to 16th with 46 to go and took 15th from AJ Allemdinger one lap later. 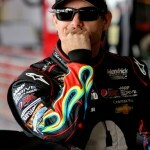 Gordon was running 13th when the caution waved with 37 to go for Jeff Burton’s blown engine. He came to pit road for tires and restarted in 16th place. 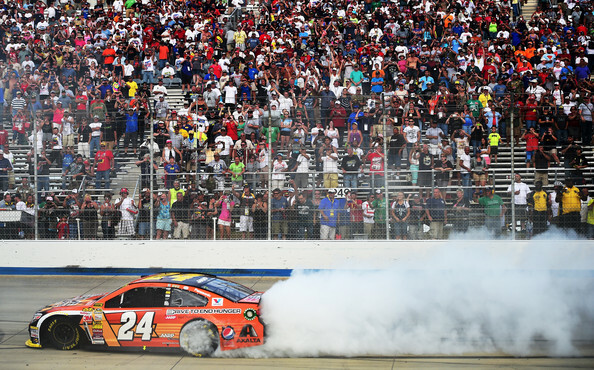 * Gordon led more laps during the event than he had in the previous 11 races at Dover combined. 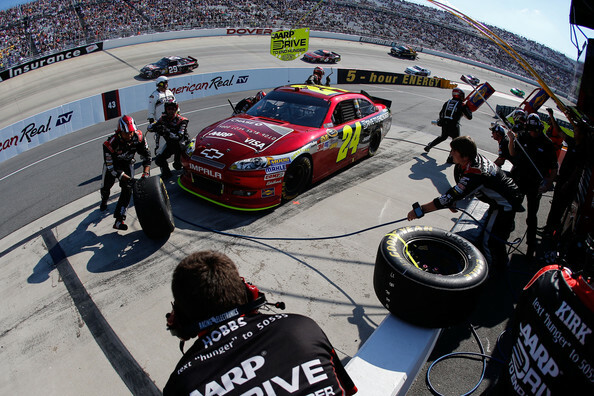 While leading the race (and pulling away) on lap 245, Gordon experienced a loose wheel and needed a pit stop. Although he may have scored the win if the race went to the end without a caution, the yellow flag on lap 340 hindered his efforts. IS IT FRUSTRATING BECAUSE YOU WERE IN THE LEAD AND THEN YOU HAD THE TIRE PROBLEM AND YOU WERE MAKING YOUR WAY BACK? WERE RESTARTS AS CRITICAL AS THEY LOOKED? YOU’VE HAD SO MANY FRUSTRATING MOMENTS THIS SEASON. DOES THIS ONE TAKE THE CAKE? OR HAVE YOU JUST HAD SO MUCH CAKE THAT IT’S ALL THE SAME? 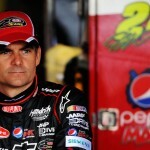 Jeff Gordon posted a 12th place finish in the AAA 400. 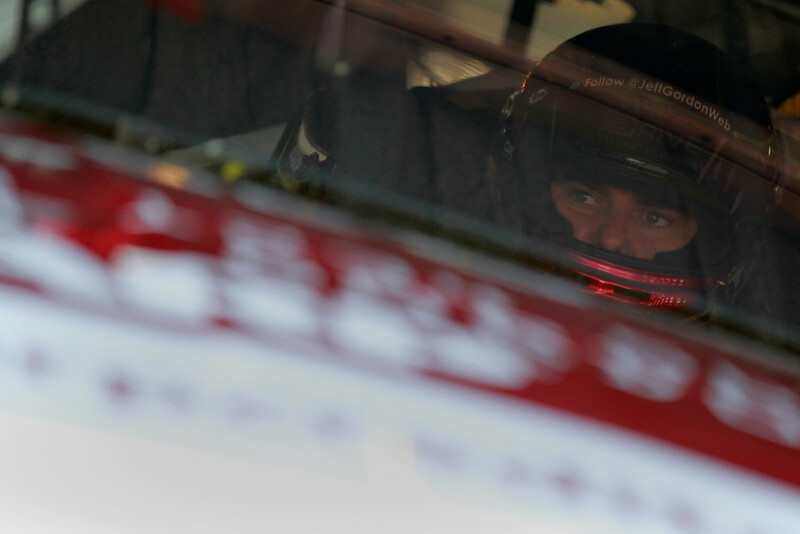 He hasn’t finished inside the top-10 in the last four races at Dover Speedway. 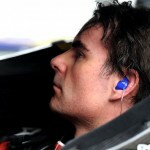 Gordon faced an uphill struggle from the outset after starting 34th. He ran as high as 9th during the day, but was never a factor for the lead. He slipped to 9th in the series standings and trails the leaders by 19 points. 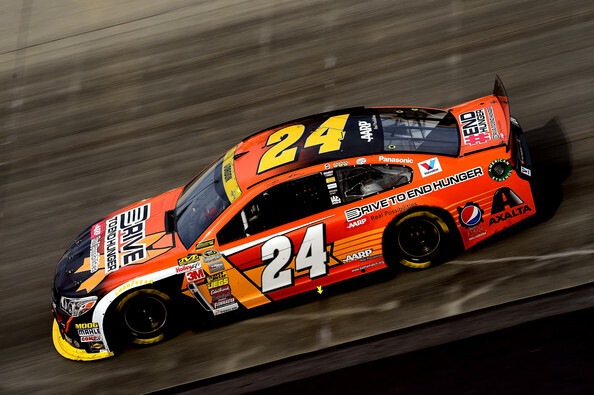 Gordon started 34th and gained six spots in the first 4 laps to move into 28th place. He gained four more spots and ran 24th on lap 10. 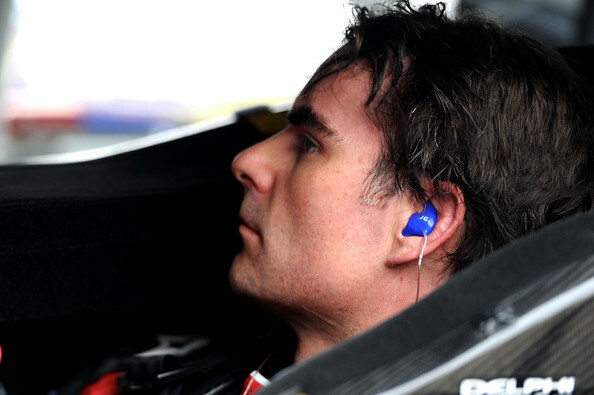 By lap 17, he was on the cusp of the top-20 as he took a spot from Juan Pablo Montoya. Light rain slowed the field on lap 19 with Gordon in 20th place. At the competition caution on lap 40, Gordon ran 19th. 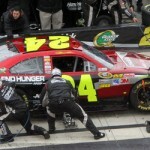 Pit stops followed with Gordon exiting in 26th place. 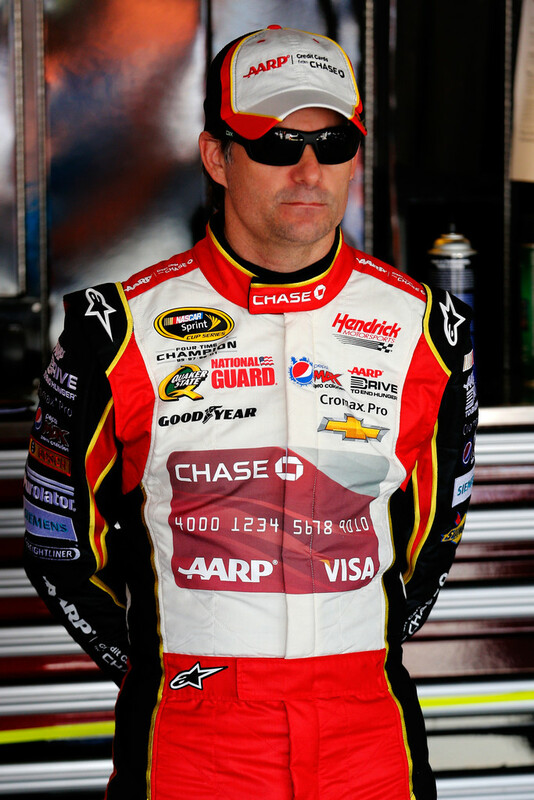 He re-entered the top-20 on lap 70, and took 19th from Tony Stewart on lap 73. Gordon moved up tp 14th before a round of green flag pit stops on lap 112. After a 13-second stop, Gordon cycled through in 13th place. 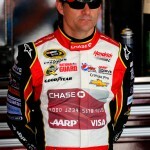 He took 12th from Mark Martin on lap 121 and closed in on Kevin Harvick for entry into the top-10. A caution for contact involving Casey Mears on lap 136 slowed the field. Gordon opted for two tires and restarted in 9th place. He dropped to 10th on lap 156 when Harvick went by. Battling a tight handling condition, he dropped to 12th by lap 160. A debris caution brought the field to pit road on lap 175. Gordon opted for four tires and restarted 13th. However, he struggled on the restart and dropped to 17th on lap 190. As the run progressed, Gordon moved back up to 14th on lap 210. Gordon re-entered the top-10 on lap 235 with a move around Harvick. 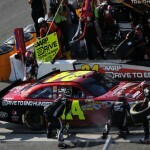 Following a round of green flag pit stops Gordon ran in 15th place. A caution flag for rain came on lap 255 and allowed Gordon to pit to top off the gas tank. He made his way to 14th on lap 280 and ran 13th when the caution waved on lap 300. With 85 laps to go, Gordon moved into 12th place. Mike Bliss’ crash with 47 laps to go slowed the field and brought the leaders to pit road. Gordon advanced to 11th when Greg Biffle crashed with 39 laps to go. 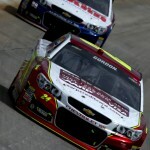 Gordon finished the race in 12th place and dropped to 9th in the series standings. 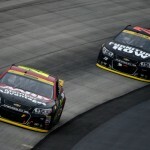 A late two-tire change didn’t work out for the DuPont team and Jeff Gordon posted a 17th place finish at Dover Internatonal Speedway. 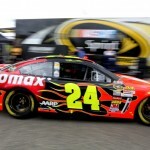 Rain washed out qualifying and Gordon started in 21st place. He moved to 17th by the first caution on lap 20. He came to pit road for two tires during the caution flag period and restarted in 23rd. At the competition caution on lap 40, Gordon had moved up to 16th. A four-tire change put him back in 24th for the restart, but he gained two spots by lap 50. Gordon came to pit road for a green flag stop on lap 110 and cycled through in 19th place. He moved up to 17th on the long green flag run on lap 155. A caution flag for light rain on lap 163 allowed Gordon to make up distance as he was about 3 seconds in front of the leader. 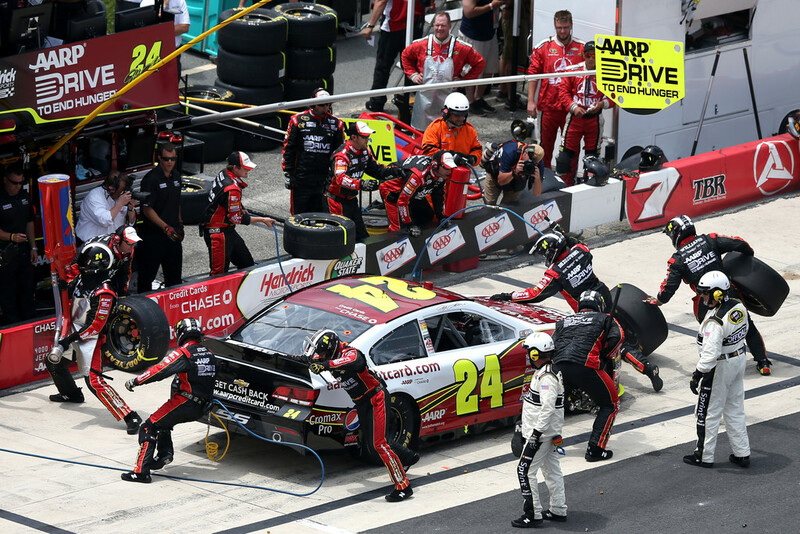 With open pit stalls in front and behind, Gordon exited pit road in 15th position. He ran 13th at the halfway point. A debris caution on lap 215 brought the field to pit road. Gordon exited in 9th place — the first time he cracked the top-10 during the race. However, he struggled on the restart and slipped to 12th within five laps. Gordon entered the top-10 on lap 281 during a green flag pit stop sequence, but ran 12th when the field cycled through on lap 292. A caution for Kasey Kahne with 70 to go brought the lead lap cars to pit road. Gordon exited in 11th place. He dropped to 12th before a caution for Juan Pablo Montoya’s spin with 40 laps to go. Pit stops followed with Gordon opting for two tires and exiting 4th. He restarted 5th after Mark Martin stayed on the track. On the restart, he fell back immediately on the inside line and ran 10th on lap 367. He fell further through the field and finished the race in 17th place. Gordon has just one top-10 finish in the last 5 races. 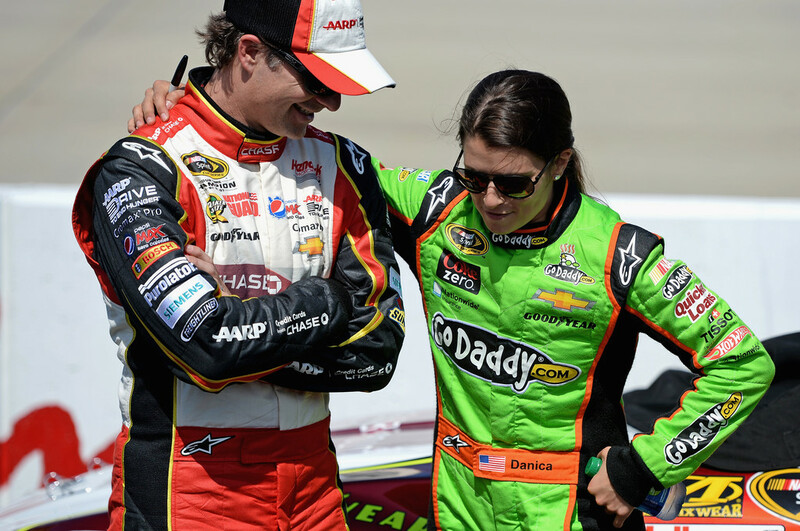 Road ahead: The All-Star race precedes the Coca-Cola 600 — both at Charlotte Motor Speedway. 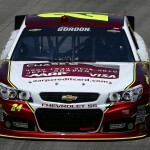 Gordon has struggled on the 1.5-mile tracks thus far in 2011 with less than stellar efforts at Las Vegas and Texas. 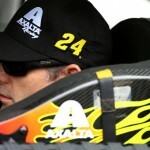 The All-Star race provides an opportunity for an extended test session under the lights. Of course, a fourth victory in the All-Star event would be the ultimate prize heading into NASCAR’s longest race on Memorial Day weekend.